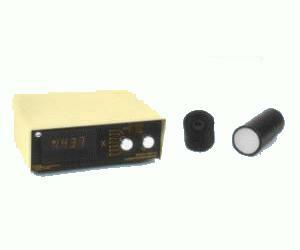 The Model 460B-1 Laser Power Meter is a portable system ideally suited for direct measurement of gas, diode and dye lasers. In spite of its small size and modest cost, the system is exceptionally accurate, versatile and easy to use. Get direct readings of average power measurements of CW or repetitively pulsed lasers. View these readings in watts or joules, at the five most common laser wavelengths, on the 3-1/2-inch, digital bipolar display. The spectral range extends from 200 nm in the ultraviolet to 1100 nm in the near infrared. Optional accessories enable direct readings at additional user-specified wavelengths, and enable measurement of integrated energy (joules), peak power and pulse shape of pulsed lasers. Additionally, a range-selector switch provides system sensitivity over seven full-scale decades (optionally expandable to twelve decades). A single control allows electrical zero and compensation for unwanted background light. All-solid-state construction assures long-term stability and reliability.